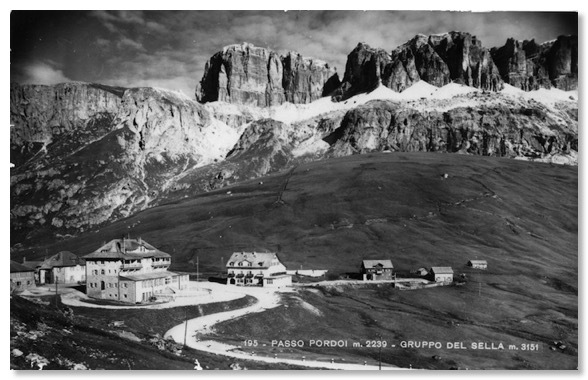 Over the past 25 years, I must have visited the Pordoi Pass dozens of times. 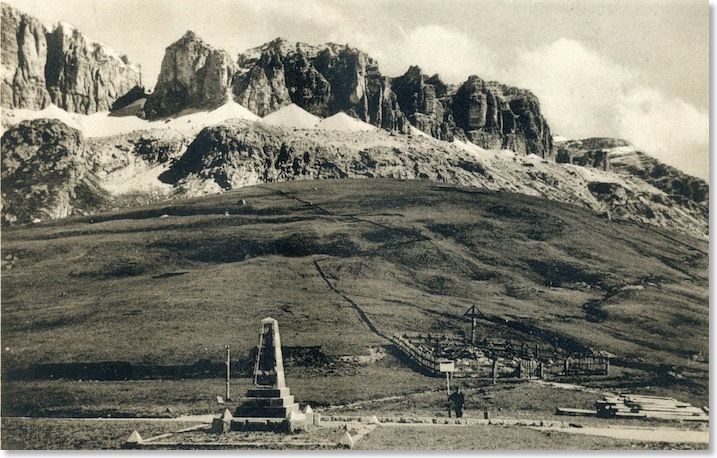 Before starting this project, I had always believed the white concrete obelisk which stands just behind the Albergo Savoia to be “just another Dolomites WWI memorial”, though I had never looked closely at it. 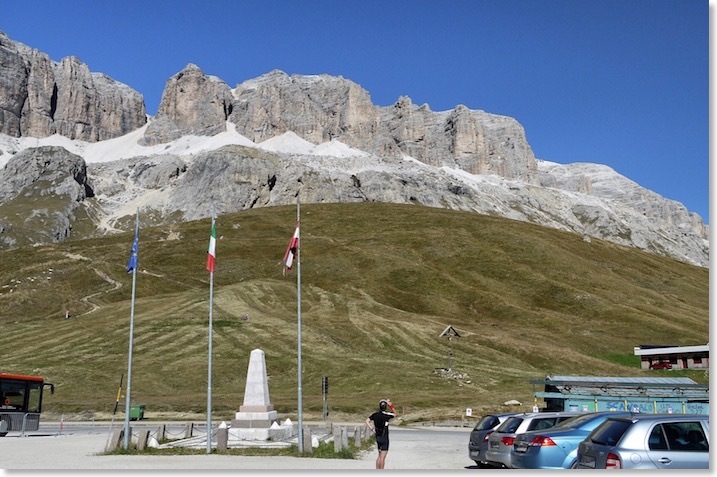 It was therefore heart-warming to find that, instead, it is a memorial to the engineers who oversaw the construction of the Great Dolomite Road! 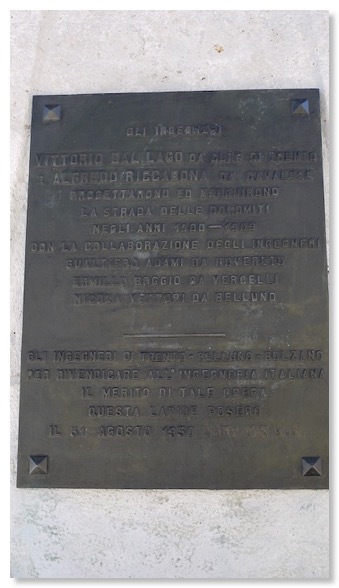 The current plaque on it (photo above) dates from the 1930s, but I believe Zardini’s photo of the monument to be earlier than that. Note that the earlier plaques (plural - today there is only one) are decorative in shape and seem to cover most sides of the obelisk. They have gone. 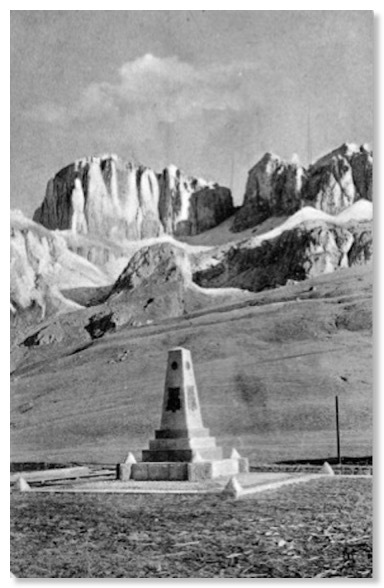 It is hard to tell, but there may still be one on the face of the obelisk looking towards the camera in Zardini’s photograph above, but there is not one on the right hand face, as viewed. Compare that with this shot, found while flea-market browsing in Florence. It looks 1920s, but sadly carries no date, and clearly has the decorative plaques in situ. 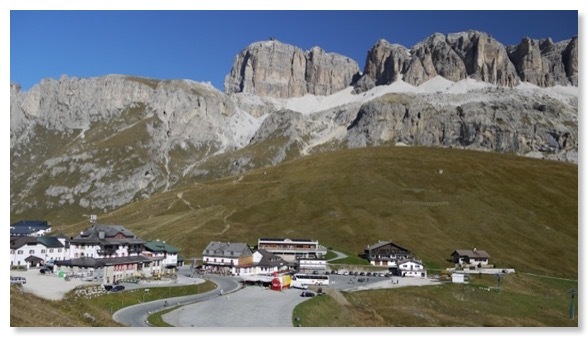 The view in Zardini’s photo at the top of this web page, and which appears in both guides to the Road, is towards the cliffs and screes that mark the southern edge of the Sella Plateau. Beneath the screes, grassy slopes run steeply down to the Road. Today, car and coach parks and a few shabby buildings clutter the same view. 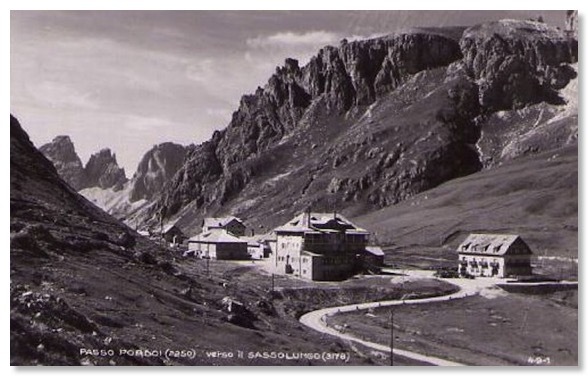 Zardini’s photo clearly shows the small WW1 cemetery beside the road. This dates the photo to maybe just a couple of years after hostilities ended in this part of the world, in 1917-18. 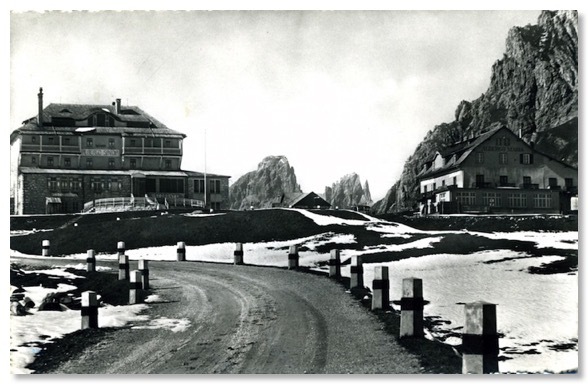 The poles also visible beside the road may subsequently have carried the electricity and telephone lines across the Pass, as seen in some of the other postcard views above. 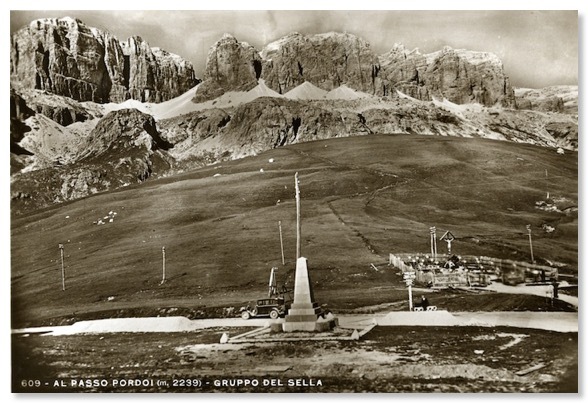 With a lens, the crucifix standing alone can be seen just below the “C” shaped enclosure towards the bottom left of the postcard itself. Rather hard to see on this scanned copy. The cars in the photo would date this shot to the 1960s. The obelisk is just out of view. 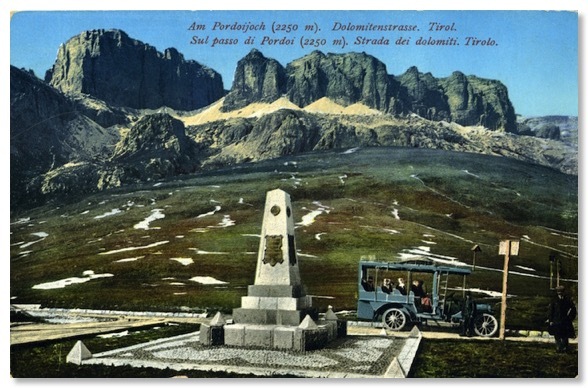 The “AZ” monogram in the bottom right hand corner identifies this as a genuine Zardini postcard, one of only few I have found so far. 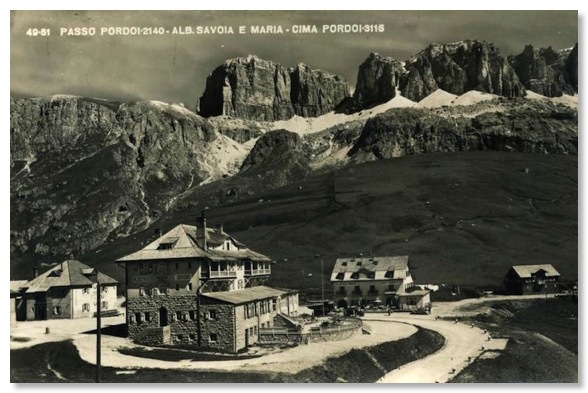 It is helpfully also very clearly date-stamped on the back for 19 August 1923 at the Albergo Savoia. This is the large building in the picture. 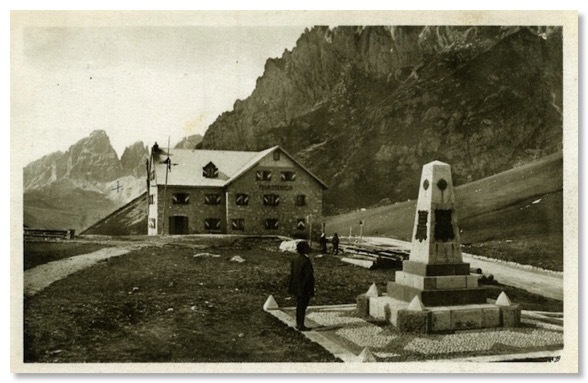 Prior to the First World War, the building was called the “Christomannoshaus”. See Photo 12 for more about this. 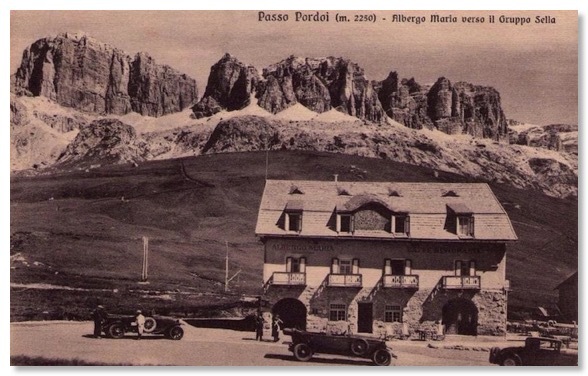 The popularity of the top of Passo Pordoi to early 20th Century Dolomites tourists is clear from the range of postcards available from early in the life of the Road. 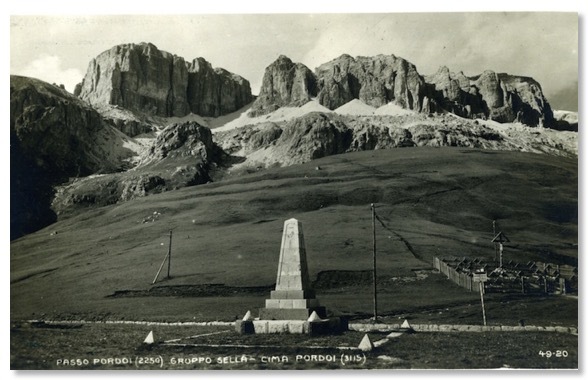 Here is one from very early on that I obtained from eBay, showing the obelisk and the Sass Pordoi and Sella cliffs above the pass. 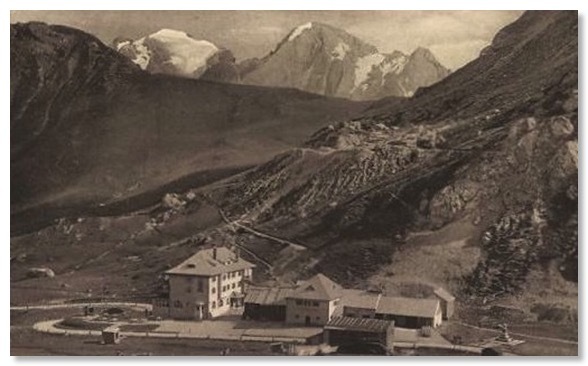 From what I had at the time, it was impossible to date with certainty, and the postcard itself contained no clue, but the neat grass slopes behind suggested to me that this may actually be a pre-WW1 photograph. This was subsequently confirmed when I saw another copy of the card on sale in an on-line auction. That copy was postmarked and hand-dated by the sender in July 1910. More evidence that collecting and researching postcards of the Road is providing valuable information for this web site! I also have this next postcard in my collection. It is hand-coloured and my own copy is undated, but I found an auction site selling another copy with the reverse, reproduced below, written by someone I assume to have been a soldier. That card is dated for November 1914. The card is not written in German or Italian and I assume the language is Serbo-Croat, which was common amongst the many thousands of Balkan soldiers fighting against the Italian forces. 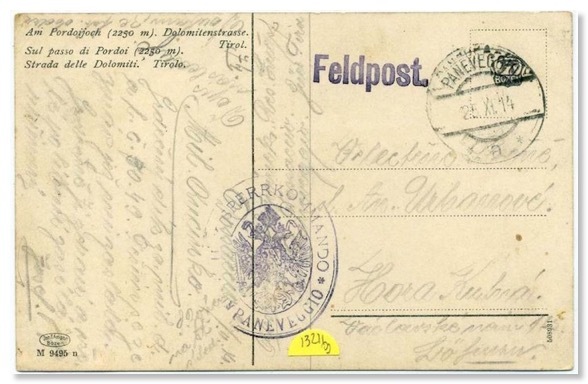 The overprinting clearly identifies it as coming from a member of the Austro-Hungarian troops who were busy fortifying this area in the early months after the declaration of WW1, and just before the fighting in this area began, in 1915. 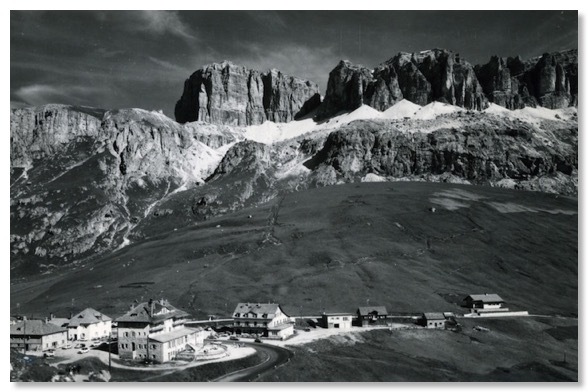 The Pordoi Pass itself was five or six miles inside the Austro-Hungarian border prior to the War. 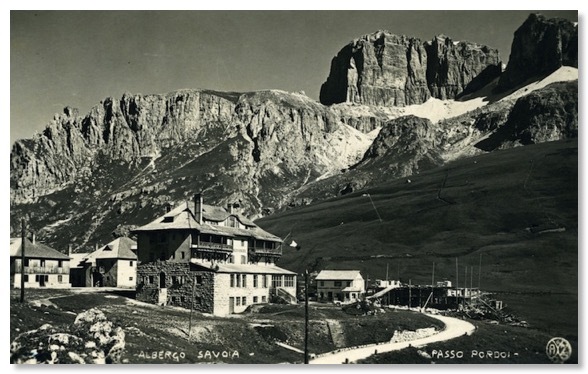 Panneveggio, mentioned in the Postmark, is also in what was Austro-Hungary, and is about ten miles south of Pordoi.